Disclosure: This is not a sponsored post. We were sent these items on behalf of Jakks Pacific for reviewing purposes. We got to watch Moana a few weeks ago and Valentina and I along with everyone else fell in love with the brave young girl who loves adventures and her family. The truth is that the entire cast of Moana is just great, there are too many to name just one. With so many toys out there it can be hard to pick the right one, especially when you know that your little one will be playing with it for hours and you want to get your moneys worth. It was a box full of goodies featuring just two of our favorite characters from Moana. Yes, those are bandaids on Moana & Mega Maui, no they didn't come with those. Valentina loves playing doctor and she's been taking care of Moana's and Mega Maui's boo boos. It wasn't all smiles in the beginning. When we first opened the box of goodies Valentina was a little bit scared of Mega Maui. Don't get us wrong, she loved him in the movie but something about seeing him in toy form did not convince her. She was a little bit scared but that lasted only about 5-10 mins. I made sure to grab Mega Maui and show Valentina that even though he was a little bit big and heavy he was still lots of fun and just as cute as in the movie. Valentina will always make sure to take both of them everywhere, they are like the three musketeers. Disney Singing Moana & Friends comes with two of her animal friends, Hei Hei the rooster and pet pig Pua. She is made of of a sturdy plastic which makes her not that light but not that heavy, just make sure to dodge if your child is a thrower. You want to avoid getting hit by the doll. Singing Moana comes dressed in the same outfit that she wears in the movie but the most noticeable thing about her is her beautiful hair. 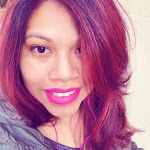 It is long and curly and your little one will love combing it or putting it into a ponytail. Valentina has spent hours playing with Moana's hair and singing the songs from Moana. Yes, we are guilty of watching the bootleg version of Moana online. Now the part for why this is a singing Moana doll. As you can see above Singing Moana comes with the necklace that her grandmother gives her in the movie. When you press the middle stone, Moana says actual movie phrases and sings a little bit of How Far I'll Go. Beautiful just like in the movie and really worth the money. And recommended for ages 3+ & up. Disney Mega Maui is big and made out of a sturdy plastic but he is a little bit on the heavy side. Little ones might have a hard time carrying him around, we always end up helping Valentina move him from room to room. He still provides hours of fun. Unlike Moana, Mega Maui's hair is of plastic, so there's no need to worry about tangles. He is also harder to throw around if you have a thrower, lol. He will just topple over so no need for dodging with him. Little girls and little boys alike will love Mega maui and his tattoos, just like in the movie he is covered in tattoos and kids will love counting them and taking in the detail. Valentina loves to sit down and have me saying stories of each tattoo. The best part is his teeth necklace hanging from his neck, when you press the middle tooth he starts singing "You're Welcome" and he also says 12 actual movie phrases. He's also been a fun partner in crime for Valentina and she's loved playing with Mega Maui. One thing to also take a note of is that Mega Maui does come with his mega sling, we found ourselves taking some precautions with that part because it is a little bit big and younger kids can poke themselves or hurt someone with it. We ended up putting his sling away for now. 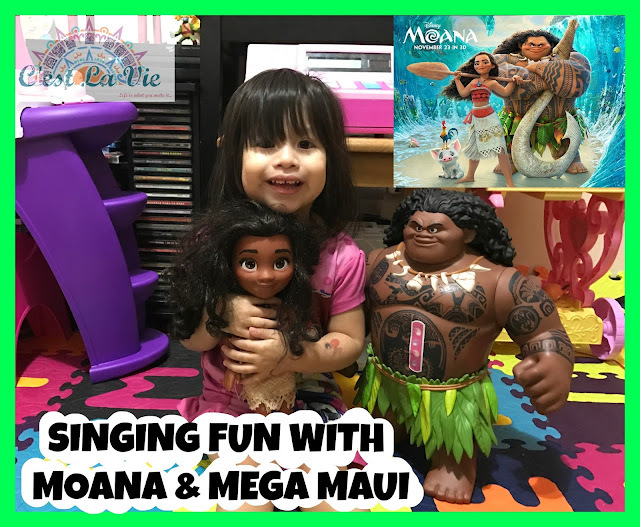 These are definitely some of our favorite Moana toys on the market, well made and provide hours of fun. Make sure to check out Jakks Pacific on their website and follow them on Twitter, Facebook and Instagram so you stay in the loop on the latest toys that come out.